HSSC JE Interview Call Letter 2016 - HSSC JE Result 2015-16 Check Scorecard / Marks Obtained - Check HSSC Junior Engineer Interview Date for Civil Electrical Mechanical (PWD) Call Letter Hall Tickets 2016 on hssc.gov.in. HSSC JE 2016 Interview Schedule Postponed: The biggest news is that HSSC has postponed the interview schedule for the post of Junior Engineer (Civil / Mechanical) to a new date. The new HSSC JE interview date will be notified very soon. For more news, read the image given here. 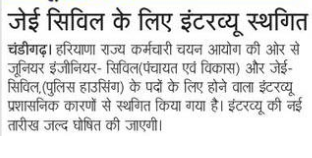 This is latest news that HSSC is under process to upload Interview Call letters for JE (Civil/ Electrical) exam 2016. It is assumed that the online Interview will be available within two or three weeks after result date. Those candidates who are qualified in written test and called for interview; they can download their interview call letter and interview schedule from direct link given here. Importance of HSSC JE Interview Letter 2016: The print out of HSSC JE Interview Letter 2016 is important from interview point of view. The HSSC Junior Engineer Interview Letter is valid with photo ID proof of the candidates such as PAN card, Voter Card etc. No one is to be allowed in the interview without having interview call letter. The HSSC JE Interview Letter should be well printed on A4 size paper, affixed colored photograph on it and duly attested. 1. Don’t forget to bring your printout of interview letter. 2. Assure photo identity proof for validity of HSSC JE Interview call letter 2016. 3. Plan your visit and don’t reach at the venue after the mentioned time. 4. No permission to examination hall for late coming candidates. 5. Avoid any of the electronic gadgets to the examination hall. 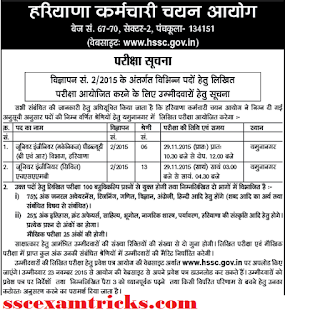 HSSC JE Selection Process 2015-16: The selection process will be completed in two stages. The first stage will be written examination which is scheduled in November 2015. The shortlisted candidates will be called for personal interview. A final merit list will be published based on the performance of both written test and interview. 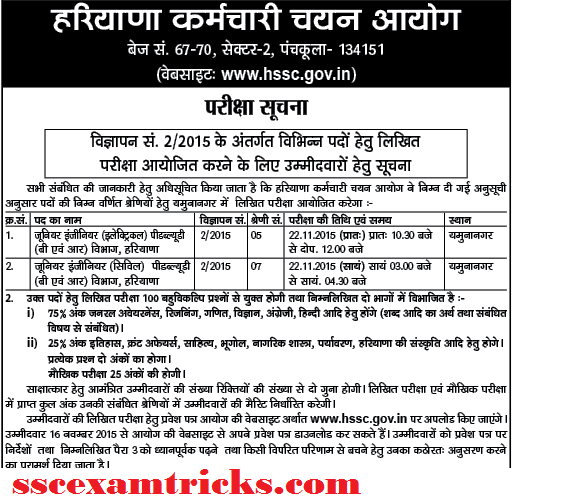 Haryana Staff Selection Commission had published the exam schedule on the official website on 22nd October 2015 at www.hssc.gov.in for the posts of Junior Engineers in Civil, Mechanical & Electrical departments in PWD (B & R) against advertisement 02/2015. The written exam had been scheduled on 22nd & 29th November 2015 in morning and evening sessions. The venue of examination was Yamuna Nagar (Haryana). In morning session, the exam was started from 10.30 am and ended on 12.00 noon and in evening session, the written test was conducted from 03.00 pm to 04.30 pm. The written exam was held for 100 marks. 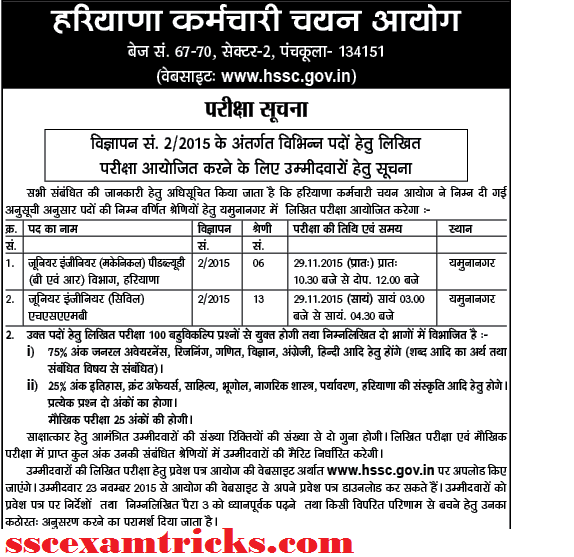 Besides that, HSSC had published important instructions which will need to be followed during the examination. HSSC JE Result is under process and will be uploaded very soon. Those candidates who have been qualified will be invited for interview schedule. The interview call letter will be uploaded 20 days before interview date. The final interview date will be announced after HSSC JE Result declaration. 1. 75% marks for General Awareness, Reasoning, Math, Science, English, etc. 2. 25% marks for History, Current Affairs, Literature, Geography, Civics, Environment, Haryanavi Culture related questions etc. 3. The qualified candidates will pass an oral test of 25 marks. 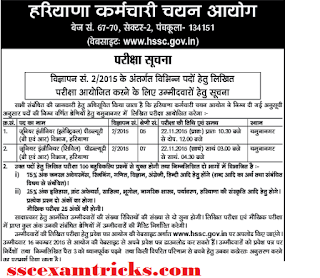 HSSC JE Result 2015-16 date: Earlier HSSC JE Examination had planned to be held on 22nd November 2015 for Civil & Electrical (PWD) and 29th November 2015 for Mechanical (PWD) & Civil (HSAMB) engineers. HSSC is working on preparing result and providing online interview call letters/ hall tickets for interview session. The result date will be available here very soon. Some of the information will play an important role to download HSSC JE Interview Call Letter 2016. This information must be given to the system as provided during the online application form such as registration number, password and date of birth etc. This information will require to be filled to get your online interview call letter for HSSC Junior Engineer Recruitment 2015-16. Procedure to download HSSC JE Interview Letter 2016: First of all, click on the link given above. The online interview call letter will be appeared on the screen. Enter the required information as discussed to download call letter/ hall ticket. Click on download admit card button and get your card in your device. Print your admit card and read all instructions provided in it.